Project Manhigh was a United States Air Force balloon flight program designed to investigate the human factors of space flight by taking men into the stratosphere. Since space is considered a hostile environment, in the middle 50's the Air Force needed to know how humans could survive there and sought to discover more of the design principles for space capsules and how to study men and their reactions when in space. The collection of such data would permit intelligent planning of future space flight experiments. Dr. John P. Stapp, who was then chief of the Aeromedical Field Laboratory, Air Force Missile Development Center, had approved the project at the local level and forwarded it through channels to obtain the necessary headquarters approval. Dr. David G. Simons of the Aeromedical Field Laboratory, was appointed the Air Force Project Officer. 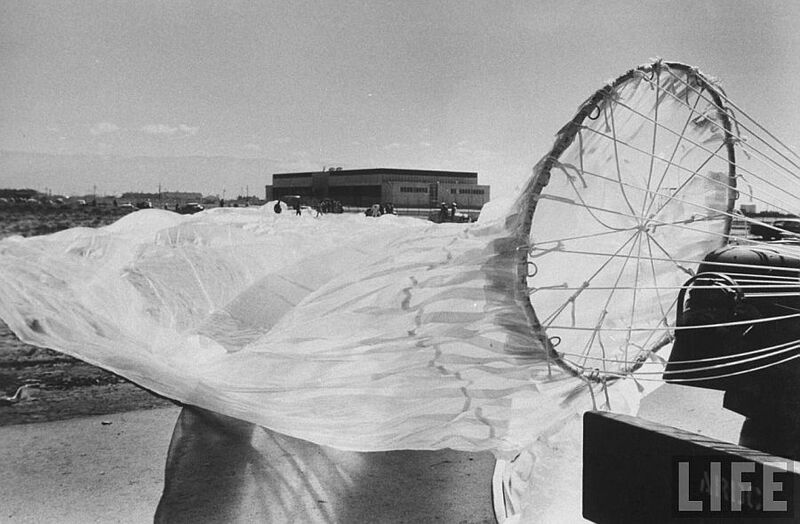 Contracts for the construction of the balloon and capsule, the balloon training of the pilots and the launch support were let to Winzen Research Inc., Minneapolis, Minnesota. Planning was jointly conducted by Holloman AFB and Winzen personnel. As the Air Force has always considered safety to be paramount, before men were allowed to ascend in the capsule, there were six unmanned flights to test all portions of the system. Also the pilot went trought a hard preparation including a parachute jump, a 24 hour claustrophobia test in the capsule, and numerous ground tests using the capsule climate control system, including a test in the high-altitude, low-temperature test chamber at Wright Air Development Center (now Wright-Patterson AFB). The capsule used in the project was basically the same with some improvements from flight to flight (click over the top image to see a detail of it). It was an aluminum-alloy, hermetically-sealed unit 8 feet high and 3 feet in diameter, with hemispherically-shaped ends. The capsule was supported in an upright position by a tubular aluminum structure with various expendable equipment attached. This structure was especially designed to serve as a shock-absorbing system during landing operations. The capsule shell was constructed of three separate sections hermetically sealed together by two circumferential clamps. The turret casting, with six portholes, was the load-carrying member for almost all the internal structure and equipment. The capsule was attached to an open, 40.4 foot extended skirt parachute with six suspension fittings positioned circumferentially around the turret casing. 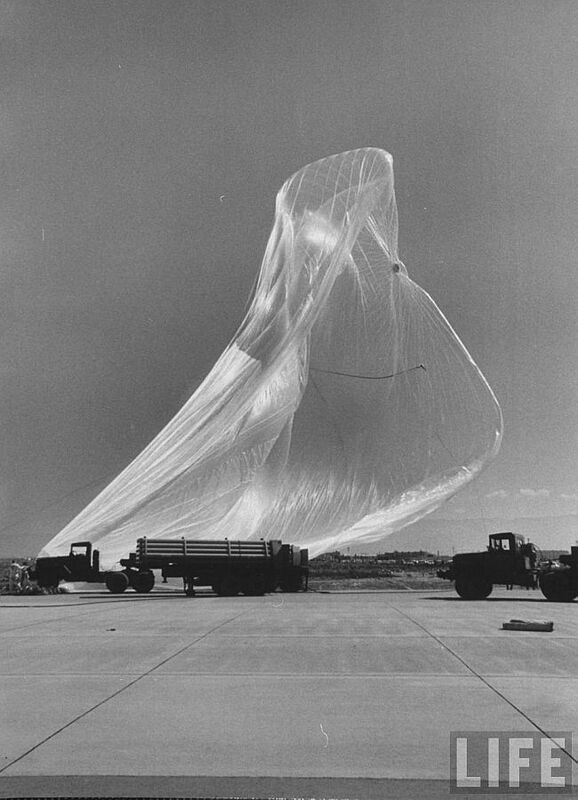 The parachute was, in turn, attached to the balloon by a stabilizing suspension system to retard any capsule oscillations during the flight. The internal pressure of the capsule was the equivalent to that of 26,000 feet, line oxygen for the pilot's breathing and for cabin pressurization was provided by a 5-liter liquid oxygen converter and a 205-cubic-inch, high-pressure bottle. An emergency 90-cubic-inch bailout supply was installed in the personal parachute harness worn by the pilot. The sealed atmosphere in the capsule was chemically treated to remove carbon dioxide and moisture, and an external water evaporation cooling system was used to maintain the capsule temperature at a comfortable level. Electrical and communications equipment was primarily installed inside the capsule. The main exception was the lead acid battery power supply. The batteries, mounted on the lower undercarriage ring and equipped with individual parachutes, were used as ballast when expended. In addition to the battery ballast, fine control was made possible by dropping steel shot through a metering valve mounted below the ballast container. A total of 246 pounds of ballast was carried on this flight. The communications equipment for Manhigh I included a Very High Frequency (VHF) transceiver with an integral Visual Omni Receiver (VOR) receiver and a High Frequency (HF) receiver for voice communications. In addition, there was a telemetering transmitter for Continuous Wave (CW) transmission in the event of failure of the voice communications system. Sequence cameras provided continuous recording of the flight progress, including photographs of the instrument panel and of the earth during the flight. The pilot was in relative control of the balloon through an electrically-driven, 14 inch diameter, fail-safe gas valve located at the balloon apex wich could be activated from the capsule. It was used to release helium gas in order to decrease the rate of ascent, and initiate or increase the rate of descent. Manhigh III's flight system was very similar in size and shape to that of Manhigh I and II, with many refinements and additional equipment incorporated. One of the changes included enlarging the capsule to 9 feet in length while the diameter remained at 3 feet. One unit that reflected considerable difference was the air regenerator. The previous flights utilized this unit outboard, ducting the air from the capsule out and back. The Manhigh III unit was inboard, with a blower picking up the capsule atmosphere directly. The chemicals previously used were discarded in favor of potassium hydroxide (KOH), because it offered greater activity in absorbing carbon dioxide and had the ability to absorb water too. The new air regenerator system used 16 pounds of KOH in stick form inserted into one-half inch diameter steel spring retainers. Because KOH is so caustic, valves were installed in the outlet and inlet which could be manually operated by the pilot to seal off the unit during landing. The unit was also designed so no liquid would reach the ports if the regenerator were laying on any side, a likely condition if the capsule landed and fell over. This was the third and last flight of the Manhigh project. The pilot choosen for the flight was Clifton M. McClure who was born in 1932 in Anderson, South Carolina, and received a bachelor of science degree in materials engineering and a master of science degree in ceramic engineering from Clemson University. Upon graduation in 1954, he was commissioned and joined the US Air Force. Initially scheduled for launch in Minnesota in August, the weather not cooperated and the flight was moved to Holloman Air Force Base (HAFB) for launch thus losing the possibility to get cosmic radiation data. After the decision to move to HAFB was reached, an Air Force C-47 left Minnesota on 3 October 1958 with all necessary equipment, including the only two balloons manufactured to manned flight specifications. A command decision was made on the afternoon of 6 October to prepare for flight unless the wind situation deteriorated. The pilot was given his final physical check and was then sealed in the capsule wich was checked out without difficulty and was brought to the launch site on schedule. 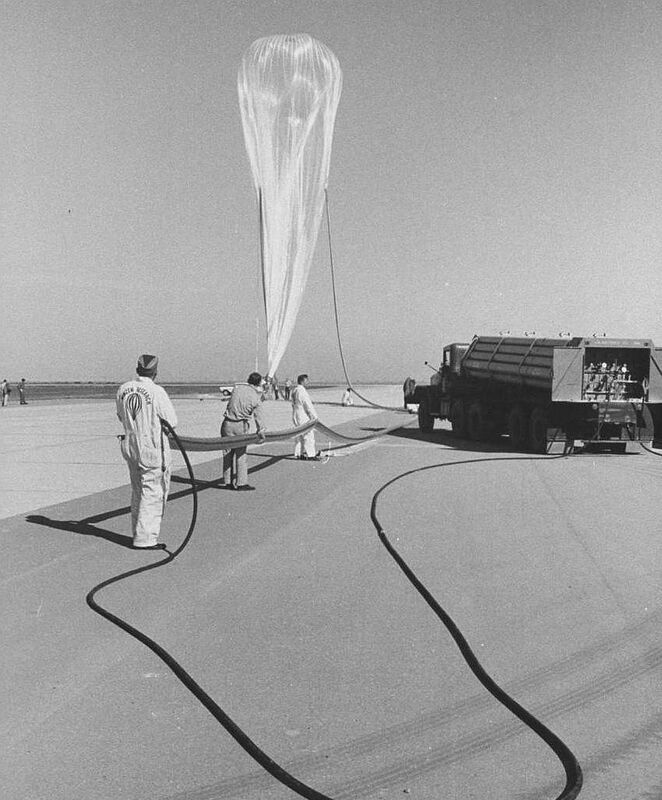 The launch point selected was at the HAFB runway immediately north of the Balloon Branch building. At 6:25 a.m., the rays of the rising sun illuminated personnel who were refilling the dry ice cap on the capsule, and balloon inflation was ready to begin. 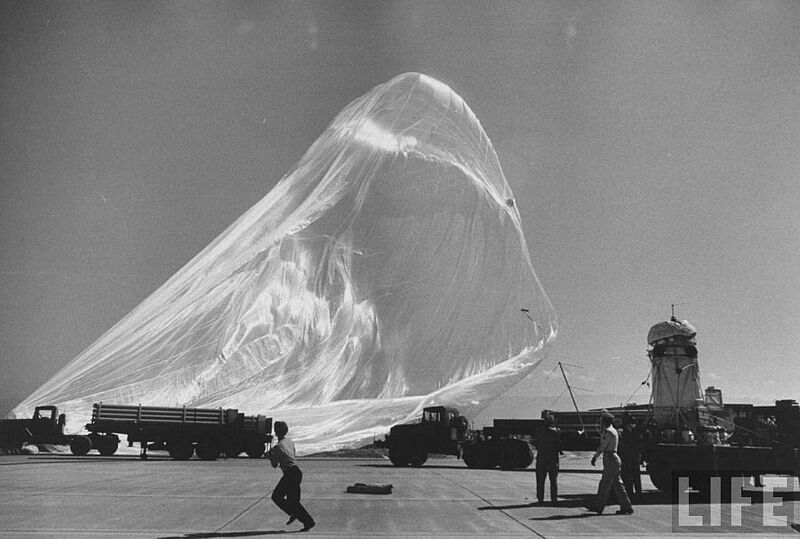 Then, 10 minutes before inflation could have been completed and the flight launched, a gust of wind caught the big balloon and destroyed it. The launch was rescheduled for the following morning using the remaining balloon.